Schrade Uncle Henry Walleye Fillet Knife | BUDK.com - Knives & Swords At The Lowest Prices! Tough and practical, Uncle Henry knives aren't afraid of work, and the Walleye Fillet Knife is no exception. 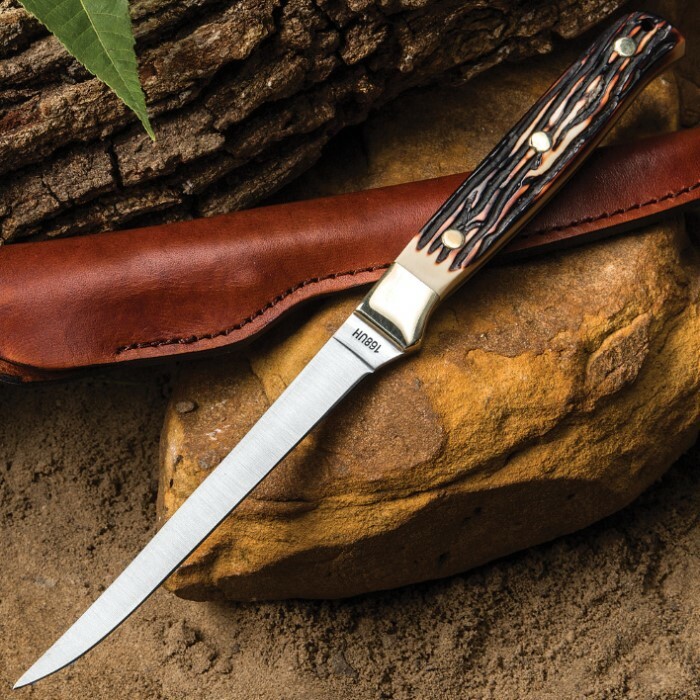 It has a razor sharp 5 3/10" 400-series stainless steel full tang blade and a handsome genuine stag handle. 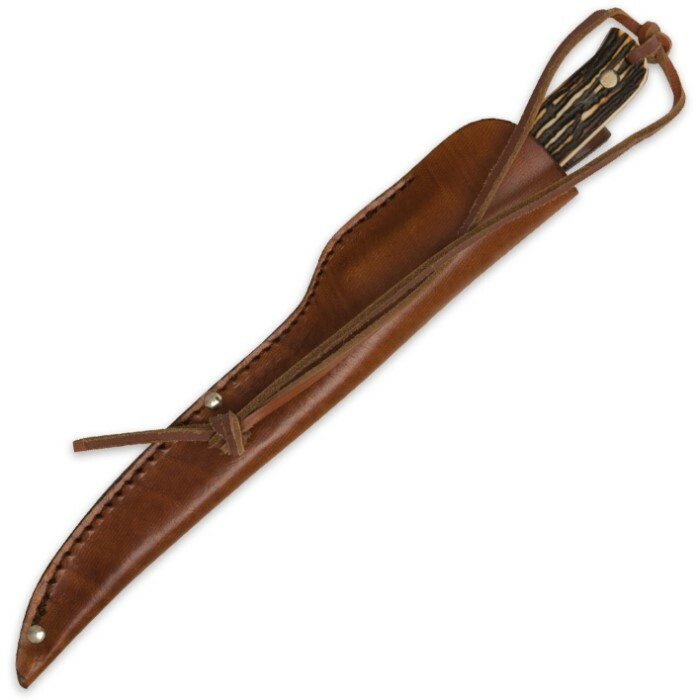 The included leather sheath and a lanyard make it easy to carry. From the durable handles to the classic styling, this handy knife just feels good to hold and is a must-have addition to any tackle box. First off I collect Shrades among others, never got a dull one till now and for a filet knife ,that's very disappointing. Overall tho, it's a quality knife like most Shrades, love the handle, the real leather sheath , wished the blade was a bit longer, but good for most catches. I take two stars off because one of the brass CAPS over the handle pins wasn't set properly and will eventually come out and the fact that I received a FILET knife that was so incredibly dull I couldn't cut my own palm by literally hitting my hand with the edge. 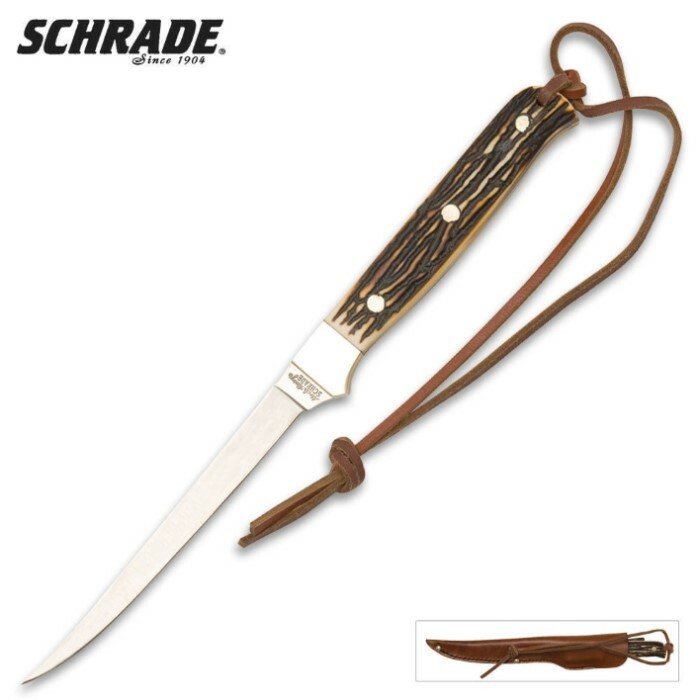 HOWEVER, Shrades are still pretty good steel and with a little work, it's now shaving sharp like most of my knives, it's a Shrade thing tho, because I also ordered the Shrade Needle boot knife dagger, and it was also dull, just not as bad as this one. Hated the edge, but after sharpening , I really like the knife, feels good, and it's a good looking filet knife in a world of plastic handled disposable filet knives .